The €320 prize includes 4 tickets to a day of your choice and a bottle of Bollinger Champagne. 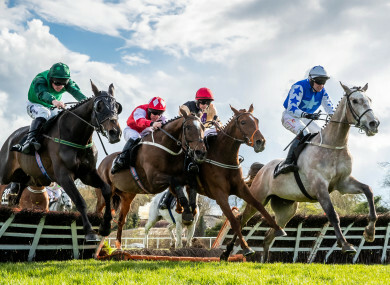 THE THUNDER OF hooves on the course, the adrenaline of a potential win and the tension of each person within the crowd hoping their horse will emerge triumphant… Nothing encapsulates these better than a day at Punchestown Festival. This year, there’s a prize pot of €3.2 million to be won on 39 races including 12 Grade 1 contests such as the Gold Cup, the Champion Hurdle and the Champion Chase, running from Tuesday 30 April to Saturday 4 May. But it’s not all about horses and hearing the ultimate insider tip – you can also expect live music, three bars (including the brand new Bollinger Lounge) and a host of delicious restaurants. Though there’s no official dress code at Punchestown, ladies are encouraged to don their most stylish clothing for the Bollinger Best Dressed Lady Competition on Friday, 3 May. This year, the winner of the Bollinger Best Dressed Lady Competition will get to attend an exclusive screening of the new James Bond movie in Paris. They’ll also get a trip to Bollinger Estate in France, staying overnight in the historic town of Reims, Michelin dining and a luxury stay in Paris – along with a chauffeur and a year’s supply of Bollinger Champagne. And if you’re looking for a little time out, the Punchestown Festival Shopping Village will host over 30 exhibitors in the best of Irish and UK design including millenary, fashion, art, sculpture and homewares. If you’d like to bring the little ones, Family Day takes place on Saturday 4 May where they can enjoy 60,000 square feet of bouncy castles, bounce n’ slide, face painters, pony rides, live theatre and entertainment from local stage schools. Sound like something you’d love to experience? We’re giving away four Reserved Enclosure Flexi tickets and a bottle of Bollinger Champagne to one lucky reader who’d like a piece of the action. Flexi tickets allow you to attend on the day of your choice, whether it’s Ladies Day, Family Day or for the Gold Cup. Simply email your name to competitions@thejournal.ie with ‘Punchestown Festival’ in the subject line. To find out more about getting your hands on tickets from €30 to this year’s jam-packed festival, click here. Terms and conditions: Prize includes four Reserved Enclosure Flexi tickets and a bottle of Bollinger Champagne. Prize is non-transferable. There is no cash alternative for any prizes. To enter, you must be 18 or over. Entry into competition will be deemed acceptance of these terms and conditions. Winner will be contacted via email. Full Journal Media T&Cs here. Fancy being part of the action at Punchestown this year? The Grand Finale of the season takes place from Tuesday 30 April to Saturday 4 May. This year’s festival features 39 races and a total prize pot of €3.2 million, along with the Bollinger Best Dressed Lady Competition, live music, buzzing bars, delicious eateries and just a little bit of retail therapy. Book tickets here. Email “WIN: An incredible VIP day for four at the Punchestown Festival”. Feedback on “WIN: An incredible VIP day for four at the Punchestown Festival”.